Most controversial fruit of all the time, commonly known as Aam is a delicious fruit that is usually loved in both of its raw and ripe form. Glycemic index of mango is 56. Its Glycemic load (for approx. 1 medium size) is 18.9 which categorizes it under higher end of the medium glycemic load range (11 to 19). IS MANGO SAFE FOR DIABETES? No, one whole mango at a time is not advisable for diabetics because of its medium glycemic index and load. This will lead to spike in sugar levels probably more rapidly as compared to other high fiber and water-filled fruits. However when mango is in season, a diabetic can occasionally satisfy his/her cravings of this delicious fruit within the suggested serving size i.e. ½ mango or 2 to 3 slices. Remember not to be carried away with its luscious taste, or else it will reflect on your blood sugar levels. Mango juice or what we call it as “aam ka ras”, mango milkshake and mango ice-cream is definitely not a suggested option as it has an additional dose of sugar too. IS MANGO SUITABLE FOR WEIGHT LOSS? Since one serving of mango (approx. 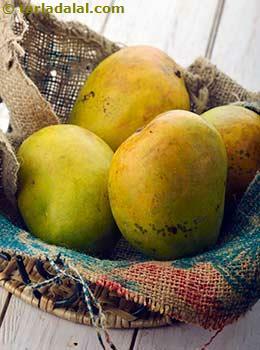 200 grams) will give you around 150 calories, it is not much suitable to consume mangoes while on weight management. Keeping low on calories at this time is the key, so ½ mango can occasionally be a part of your meal and you may benefit from its vitamin A and C content. However ensure not to pair it with any other source of high carb fruit or other food.